Still haven't decided what to have for dinner tonight? Here are some recipes to inspire you. The recipes come from a 1951 issue of HomeMaker's Digest, which was published by The Homemaker's Institute in Evansville, Indiana, and featured a compilation of articles and highlights from home and women's magazines. How Big Is a Closet? 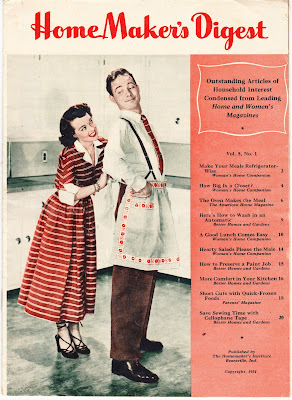 "Here's a good substantial oven dinner which takes about one hour's cooking time. Full of vitamins, easy to prepare, simple to serve. For convenience, plus gustatory gratification, you can't beat oven meals. Thanks to modern insulation, you're not conscious the heat's on ... the oven gets hot, but you keep cool. We have sneaked in two rather touchy subjects -- liver and carrots. They're such human benefactors, it seems a shame to neglect them." The full suggested menu includes Fluffy Rice Norman1, Liver-Sausage in Green Peppers, Vegetables en Papillote, Cucumber Tomato Salad with Avocado Pineapple Dressing and Hot Fruit Compote. 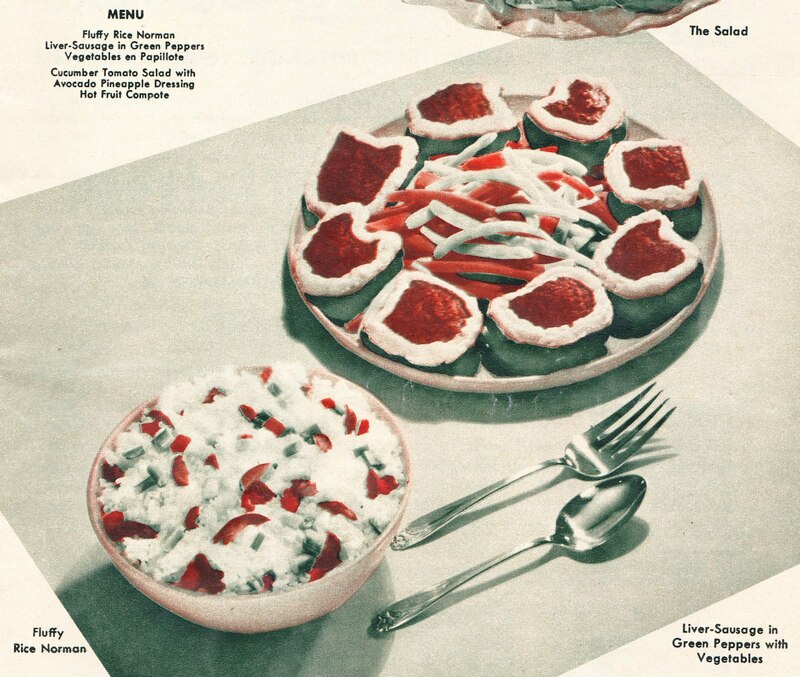 Here are the recipes for the main dish and side, if you want to give them a try and party like it's 1951. Cut liver in 2-inch pieces, scald in boiling water for 10 minutes. Remove, cool slightly before putting through meat grinder, combine with sausage and minced onion. Cut peppers in half lengthwise, remove seeds, place in boiling water 3 minutes, drain. Fill halves with liver-sausage mixture. Set in open pan, bake in moderate oven (350°) for 1 hour. POTATO TOPPING: Wrap potato in aluminum foil, bake along with meat. Remove from foil, skin, mash, and beat in egg. Place fluffy mixture in length of brown paper. Roll paper to form cone; fold down broad end of cone, squeeze potato mixture, as from tube, through small opening to decorate meat servings. Combine ingredients in tightly covered casserole, add boiling water, cover, place in moderate oven (350° F.). Bake 45-60 minutes. Come back and let us know how it is, if you give it a whirl! 1. 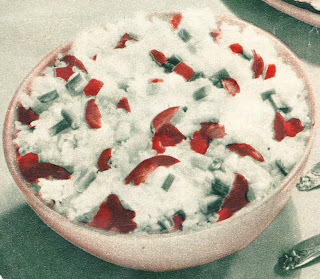 In preparing this blog post, I did a Google search for "Fluffy Rice Norman" and got zero matches. So Papergreat has now officially introduced Fluffy Rice Norman to cyberspace. There was a reason Fluffy Rice Norman was omitted from cyberspace, and now you've contaminated the universe. Stalin's "Marxism and the National Question"